Randy Sue Collins, Expert Beekeeper, and Paul Martin, Film Director, have joined forces to create an educational DVD for beginning beekeepers titled Organic Beekeeping 101. It is their hope that this DVD will inspire and motivate people nationwide to start their own hives, keep bees organically and save the planet! Randy Sue Collins was a full time fine artist painting landscapes as well as pet and animal portraits, until she discovered the wonderful world of honeybees. 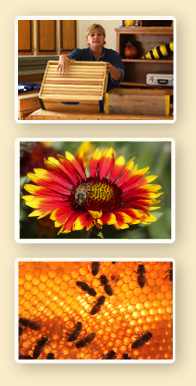 "My life changed the day I placed my first honeybee hive in my yard." Since that day Randy Sue has dedicated her life to understanding more about our fuzzy friends that are crucial to mankind's survival and how she can help protect and support the species. She is passionate about bees and an avid beekeeper with over a dozen hives.